Journaling is this neat little therapeutic exercise some people partake in on a regular basis – it helps them process complicated situations and complex feelings, solve problems, interpret dreams, and probably most often, encapsulate memories. I am a terrible diary-keeper. If anyone wants to know my secrets, they’ll have to ask me directly, because I’ve never been able to keep a steady journal going. I’ve gotten through a day or two of consecutive writing, but I always end up losing discipline and my journal inevitably falls by the wayside. The reason I bring up journaling is because it is a super handy practice to have while traveling! It’s also a practice I don’t have – but wish I did! Don’t get me wrong, I always bring a little pocket notebook along when I travel because it’s useful to have, but I rarely keep an actual travelogue. 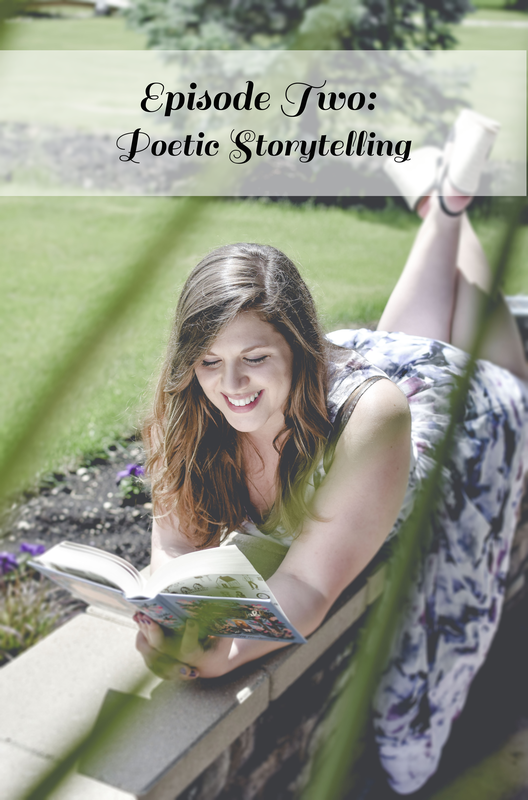 You might be wondering, then, how I know journaling to be useful. Well, I had the pleasure of keeping a journal as part of a school assignment while in South Africa – and now, friends, I know what I’m missing when I don’t keep one. 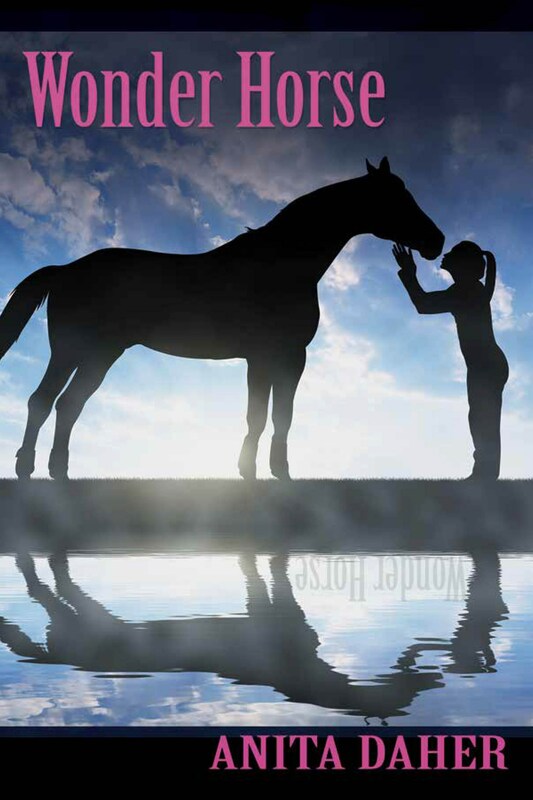 There’s no better way to preserve memories and thoughts than by writing down your reflections as they happen. Now, I’m not saying that journaling trumps photography – I know photos can do a lot to capture where you’ve been (I love my travel pics!) – but it’s an entirely different experience to go back and read your travel journal than to flip through a photo album (both equally fun!). I’ll be honest, I kind of forgot about my South Africa journal until I was cleaning out my room this summer. I am quite obsessed with stationary and have a collection of pretty journals that are rather untouched – but one was more used and worn than its fellows. I remembered this journal as the one I had along with me in South Africa and began to skim – in no time, an hour had gone by. Wow, what an experience to relive a trip from four years ago – the journal brought back so many memories and experiences I had forgotten. I went to South Africa with a group of graduate and undergraduate students, and at the end of our trip, one member of the group decided to combine photos and quotes from our journals to create a photo book. Honestly, I have never had a more precious keepsake from a trip! If you’re planning a trip in the near future, I highly recommend keeping a journal or travel blog – trust me, you won’t ever regret having a record of what you’ve done and where you’ve been. What else can your journal do for you? So, you aren’t as in to keeping a diary when you travel? That’s okay! Travel journals come in handy regardless of how you use them. I always bring along a little journal when I travel because that’s where I keep a list of emergency contacts, passport info, embassy info, flight itineraries, useful websites, and a list of expenses (handy for Customs at the end of the trip!). I’ve also met people who glue city maps into their journals so that if technology fails them, they have a back-up at the ready (brilliant!). Where can you get one of these fancy journals? You don’t have to go far to find a good journal to bring along. Chapters and McNally Robinson each have an excellent selection (the journals in the pic above are all from Chapters). I’m also #obsessed with Tiny Feast and Rifle Paper Co. 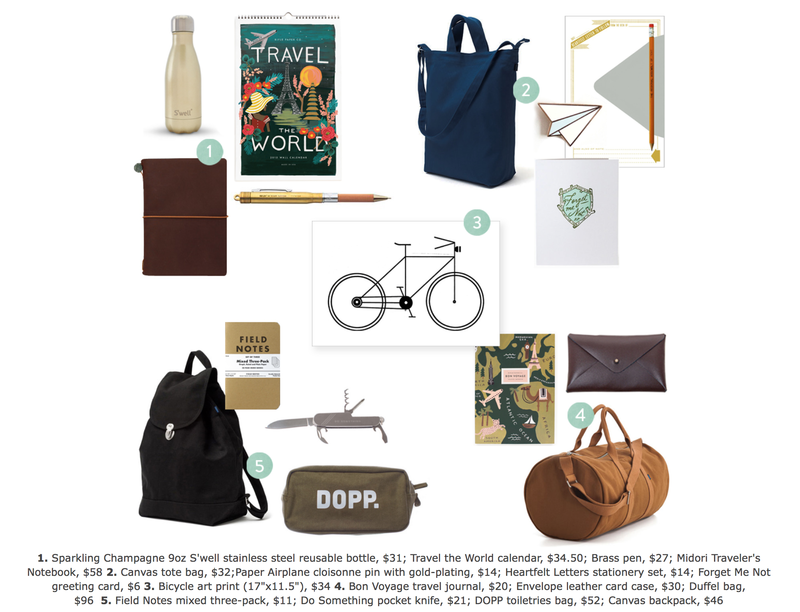 Tiny Feast’s gift guide for travellers. Amazing. My amazing colleagues at Career Trek gifted me with this lovely set of Rifle Paper Co. notebooks from Tiny Feast before I went back to school this past September. They know me well. Have you ever kept a journal on your travels? Hit me up on social or write a comment below. I love when you share your travel stories with me! Welcome back! I took a bit of break from writing over the holidays to take full advantage of my time off, and it was blissful. I did a lot of sleeping, reading, movie watching, treat eating, crafting (see my last blog post! ), and friend seeing – I feel like I don’t get to see everyone as much as I would like to when school is in full swing so it was very nice to see friends and family, and relax. I hope you all had a fantastic holiday as well! Now it’s official: 2015 is here – which means new classmates, new projects, and of course, new books to read! I just finished Ken Follett’s Edge of Eternity over the break – the book is about the size of your average Bible so I waited until Christmas to read it so that I could give the story my undivided attention and it was well worth the wait. The book spans 1961 to 2008 and wow was there a lot to cover. Follett writes with clarity, wisdom, and honesty about the rise and fall of the Berlin Wall, the decades-long battle for civil rights in the U.S.A., the Vietnam War, the changing landscape of communism and the Soviet Union during the Cold War (with some impressive discussion on the Cuban Missile Crisis), the Watergate scandal (which was great prep for reading All the President’s Men this semester! For a sneak peak about the legacy of Watergate and the Washington Post’s Pulitzer-winning coverage, check out this link), and so much more. Through characters experiencing historic events on the front lines, Follett leads us on a journey through the last third of the 20th Century, tying up loose ends and finishing off his epic Century trilogy that began with Fall of Giants and continued with Winter of the World. If you’re seeking a better understanding of the cultural, political, and social tensions and transformations that took place between 1900 and today, read this trilogy. It was so well written and I look forward to seeing what Follett writes next (I’ll need a BIG book to read when we take a break from CreComm over the summer!). Now that I’m pretty well-versed on the 1960s and 70s, I’m delving into All the President’s Men for my Journalism class. I don’t normally read non-fiction because I’m a sucker for fiction and fantasy, but so far I’m finding All the President’s Men riveting. 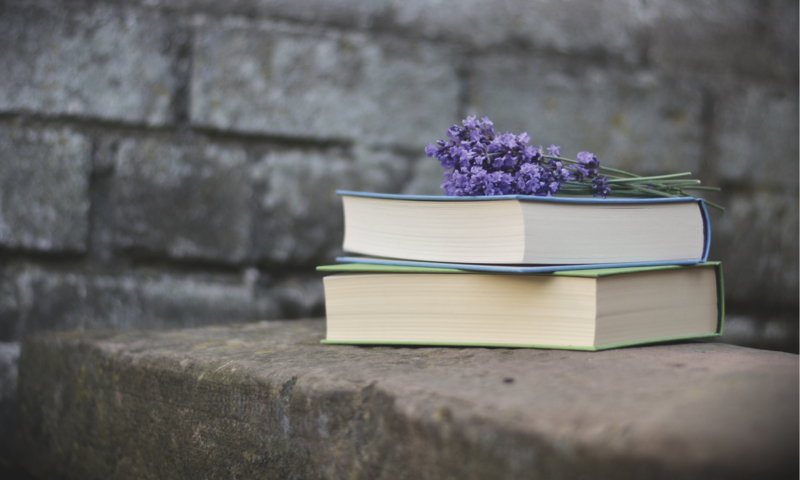 Up next, I’m hoping to read some classics that have been on my shelf for a while, including Doctor Zhivago, War and Peace, 1984, and To Kill a Mockingbird (I’m sensing a 1960s/Russia/revolution theme…). However, I might change things up on you – Anne of Green Gables is also looking like a good prospect. So many choices! I’ll just have to keep you guessing. Here’s to a new year of adventures on the page and in real life! I hope you are all enjoying this holiday season with friends, family, and good food! As we say goodbye to 2014 and welcome in a brand new year, I am especially grateful for my super supportive friends, my lovely family, my amazing grandparents (who survived a devastating house fire in mid-December and are starting a new chapter of their lives), stitches being removed early (allowing me to eat delicious Christmas baking I thought I’d miss out on! ), and, of course, for books! My family knows me oh so well and gifted me with a the classic novel Anne of Green Gables by L.M. Montgomery this Christmas. I have never read Anne of Green Gables (how un-Canadian of me! ), so I’m excited to read it. What makes this book particularly special? 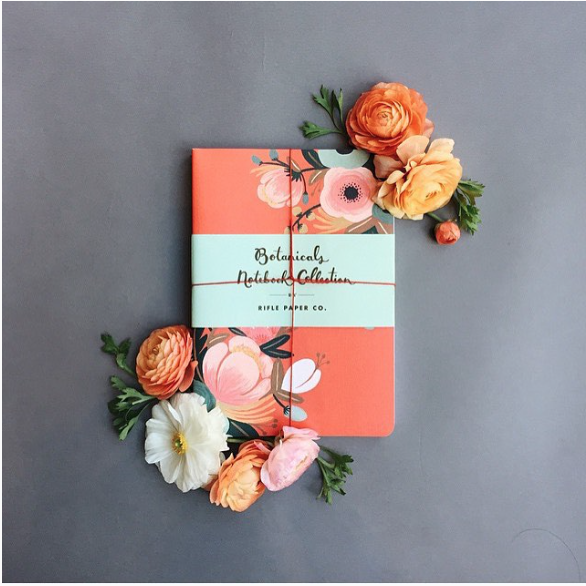 My mom found me an edition with a cover designed by Anna Bond, co-founder and Chief Creative Officer of Rifle Paper Co., a beautiful stationary and gift company that I’m currently obsessed with. 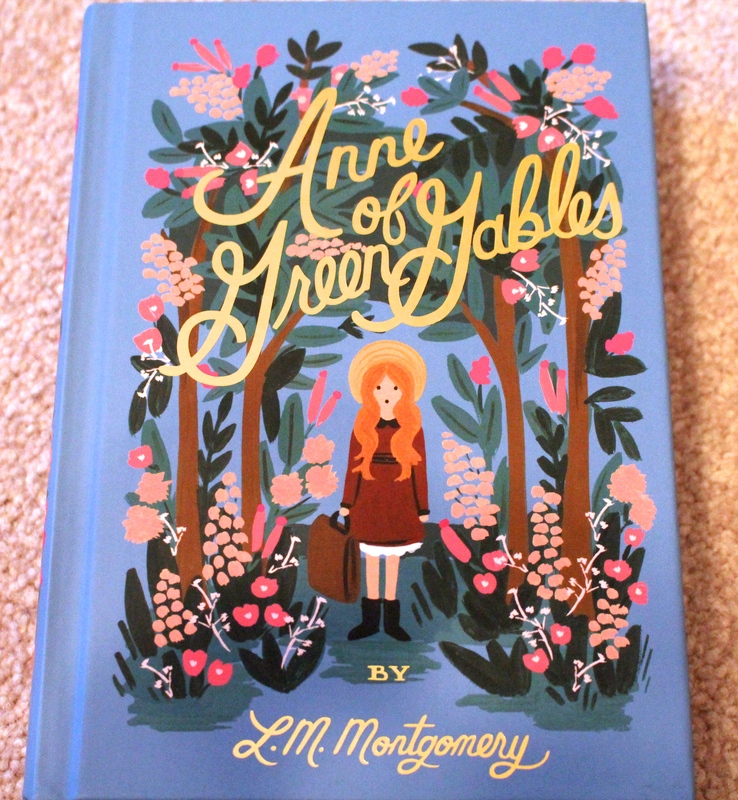 Bond designed four book covers for Puffin’s In Bloom collaboration, including Anne of Green Gables, Little Women, Heidi, and A Little Princess. Mom picked my new copy of Anne of Green Gables up at Anthropologie at Polo Park. You can also find Rifle Paper Co. products at all of my favourite stores, including Chapters, Pineridge Hollow, and Tiny Feast in the Exchange District. I purchased my 2015 calendar at Chapters and my iPhone case at Pineridge Hollow. 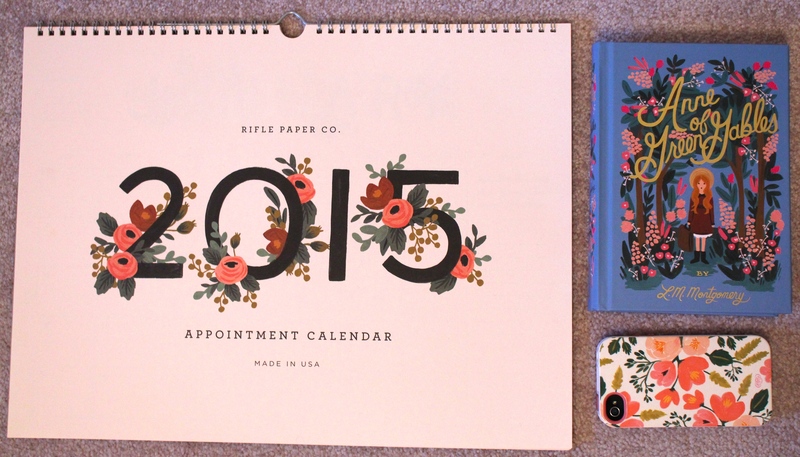 Like I said, I’m quite obsessed with Rifle Paper Co. designs! Rifle Paper Co. products can be a little pricey so our crafty friend Martha Stewart has provided us with a way to get our very own Rifle Paper Co. designed bags at an economical price – how, you ask? In the December 2014 edition of Martha Stewart Living, Bond provides a design template for painting leather clutches/purses/pouches based on a bag she painted for herself during Fashion Week. You can find the step-by-step instructions here. Because I am enjoying a glorious amount of free time, I decided to craft my Saturday away and here are the pretty results! The materials I used – most were purchased at Michaels. Front of the bag leaf pattern: done! Front of the bag with berries, caps, and stems! Painting on the first leaf – please forgive the chipped finger nails! If you decide that you want your very own Rifle Paper Co. designed bag, too, I recommend using a bag with a smooth, leather(like) surface. The bag I used had a pebbled texture that made tracing the pattern with transfer paper a little tricky. Depending on the surface you decide to paint on, you may have to do multiple coats of paint – I did two coats of each colour, with one hour of drying time between coats. If you use the Sharpie paint pen (highly recommended! ), allow the paint a minimum of 24-hours to dry. Happy reading and happy crafting, friends! Last Saturday, my friend Kaeri and I embarked on our annual Christmas shopping adventure. It’s something we have been doing for almost 10 years (yeah, that doesn’t make me feel old…) and I look forward to it every holiday season – it’s one of my favourite Christmas traditions! Because we rarely see each other any more (I’m not really blaming CreComm, but I might be just a little bit), not only did we get some shopping in, but we also decided to hit up Cineplex Polo Park to see Mockingjay: Part 1, the latest instalment of The Hunger Games. I read the books before the movies were made and while I didn’t love them, I have to acknowledge that Suzanne Collins has worked some brilliant concepts into her series. When I first read the books, I read them through the lens of my degree so I couldn’t help but analyze the political and revolutionary elements of the series. However, watching the most recent movie last weekend, I looked at those elements through a CreComm lens. One of the most fascinating aspects of The Hunger Games series, seen most prominently in Mockingjay Part 1, is how everything in Panem is highly produced. The Hunger Games themselves are a reality TV show where the audience is encouraged to vote on their favourite competitors and encourage donors to send them care packages based on how well-liked they are. And Katniss as a symbol of the revolutionary movement = highly produced and marketed as something to sell. She’s a commodity to be controlled and sold. It bothers me so much. And as much as I know that Collins did this as a social commentary and as satire, I can’t stand it. And this has made me take a critical look at how advertising and and public relations can be used maliciously to contort messages and control public opinion and societal values. Crazy. So here’s a reminder to be aware of what messages you’re sending when you create campaigns. And to be aware of what your clients stand for. Mockingjay has been banned by one theatre company in Thailand because protesters have been using the three-finger salute from the books in peaceful protest against the military that organized a coup in early Spring of this year. This gives me chills. I love that pop culture has the power to trickle down into our every day lives and inspire change. I think it’s so cool that a symbol from a book has become a vital symbol in a real movement and is creating dialogue and awareness about a social justice issue. Usually, real events inspire and inform books, television, and film. We get our ideas from true stories because the craziest stuff happens in real life. However, this is a really cool example of give and take. It’s refreshing to see pop culture influence reality in a positive and fascinating way. I love it when literature makes you think! It always should! I hope you all have a wonderful Christmas – this may be my last post until January, but who knows, I may surprise you with a little literary fun over the break. Because I am still working my way through The Goldfinch, I thought I would tell you a little bit about the 2014 Goodreads Choice Awards. I found out about Goodreads from a friend of mine while we were traveling through South Africa a couple of years ago – he was surprised I had never heard of it because it is the online hub for readers to share reviews with one another and bond over favourite titles, and I really love books. So naturally, I should have known about this website! He encouraged me to get the app and join the community and, so far, it’s been a useful tool to keep track of what I’ve read, what I want to read next, and what is coming out soon. Every year, Goodreads assembles a list of the most popular and bestselling books of the year and invites the community to vote for the best of the best per category. As of today, over 1,000,000 votes have been cast for the 2014 opening round – that’s pretty exciting! It’s encouraging to see so many readers engaged online. I already cast my votes for this round of voting and I’m happy to see a few of my favourites from this year listed as nominees. I’ve also found a few new titles to pick up on my next bookstore run. Check out this year’s nominees and cast your vote!